Email-id are given below. Required Details like Salary, Important dates, Selection Process, Email-id, Qualification are maintained below. KCP Siddhartha Adarsh Residential Public School . Ending date to apply Teacher Jobs: with in a weak. Senior Secondary Classes: First Class Post Graduates with recognized B.Ed. Degree in the subject of Mathematics to tech 1+ and +2 Classes. 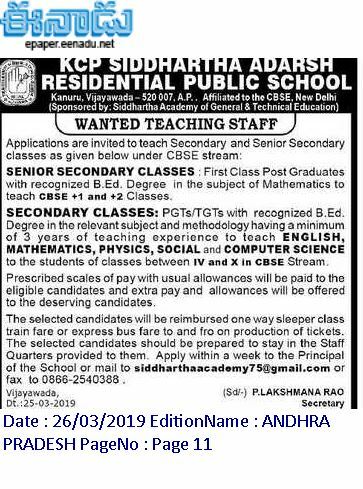 Secondary Classes: PGTs/TGTs with recognized B.Ed. 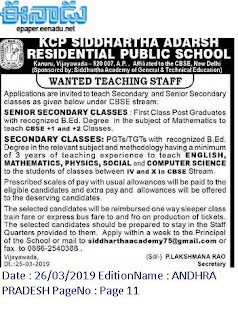 Degree in the relevant subject and methodology having a minimum 3 Years of teaching Experience to teach English, Mathematics, Physics, Social and Computer Science to the students of classes between IV and X in CBSE Stream. Eligible Applicants can send to the School principal or School Email-id are maintained below.